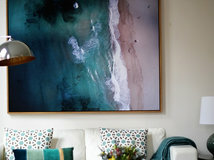 Houzz Contributor, Feature Writer and Editor for a range of Australian lifestyle publications. 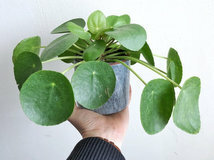 I have always been a renter, which means I have had the opportunity to try out a lot of different living styles (from eensy weensy apartments to rambling old Queenslanders). 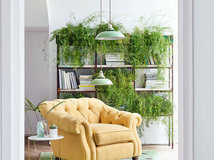 It also means I have spent a lot of time working out how to make small and awkward spaces work, as well as deciding what I will and won't do when it finally comes to renovating or building my own home. [Insert dreamy sigh.] 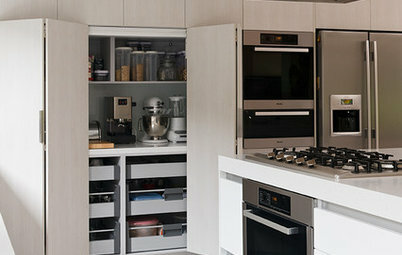 I love to cook, so beautiful, well-designed kitchens tend to take the starring role in my homeowner daydreams. 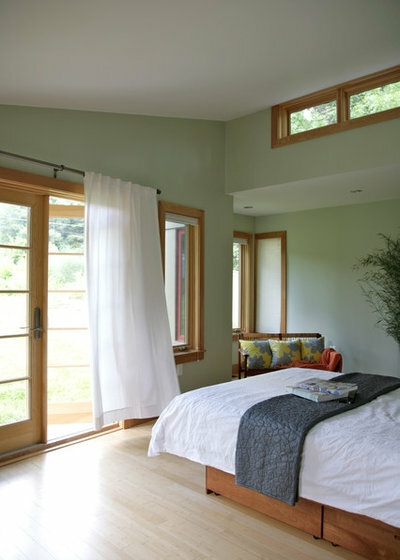 While most people still tend to stick to safe shades of white or cream for the walls of their sleep-time sanctuary, they are certainly not the only hues that work to create the necessary tranquil and relaxing vibe for this important space. 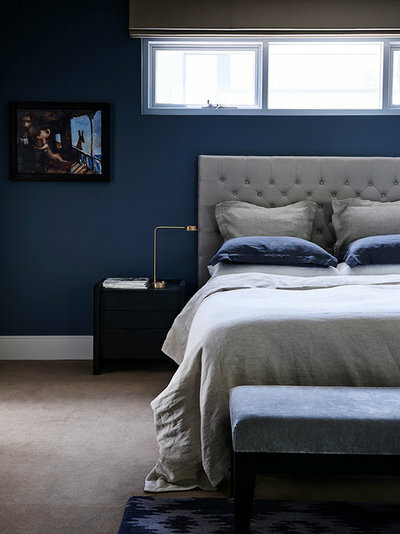 From warm and cosy reds to elegant duck-egg blues, versatile greys and dramatic – yet surprisingly calming – black, we take a spin of the colour wheel to help you figure out the best colours for your bedroom walls. 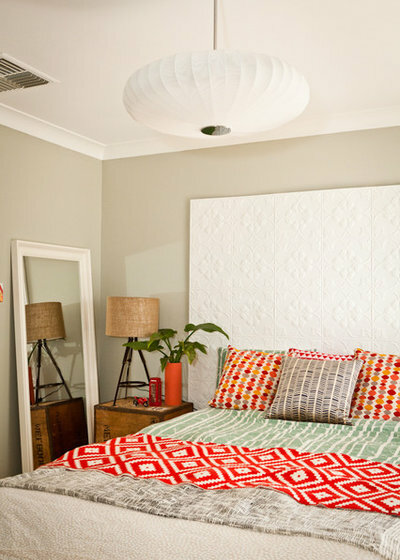 “Grey works well in rooms with lots of natural light, high ceilings, light floors and a large space,” says Stacey. But she warns that when using grey you need to be careful selecting the right hue. “Avoid greys that have a purple or pink undertone as this can completely change the look or feel you were initially hoping for,” she advises. “We love using grey, particularly deep, strong greys in the bedroom because it is a neutral colour and goes with anything. 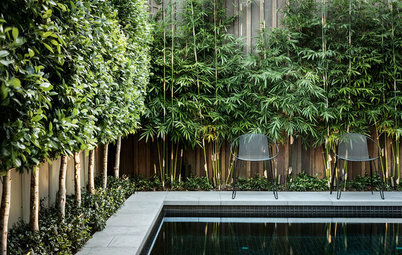 It also allows a space to become dramatic without being overbearing,” explains Stacey. Reffet also enjoys working with grey in the bedroom. 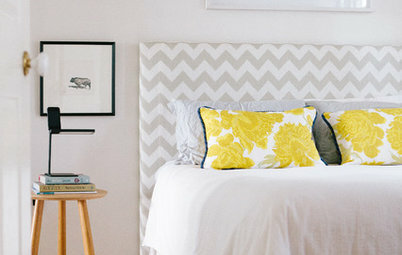 “Both light greys and dark greys are timeless and lovely, however, they don’t suit every bedroom,” she says. 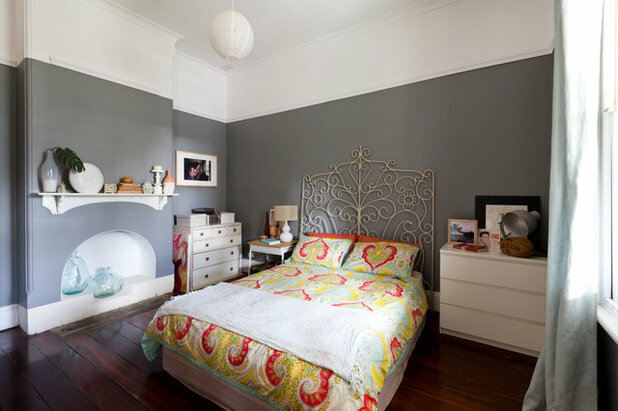 “If you want a relaxing but not too intense atmosphere, go for a light to medium grey. 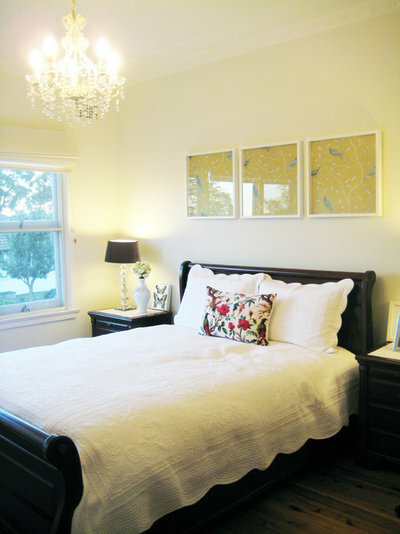 If your bedroom receives little natural light, opt for a light grey – it will always look darker in your room. 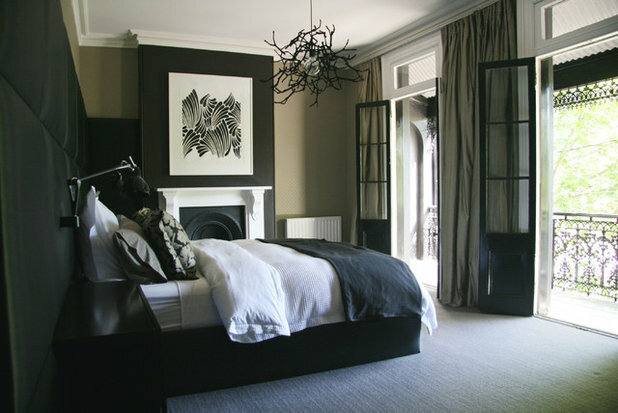 “While I do love the look of a super cosy and dramatic dark grey bedroom, I do not recommend this shade for a poorly lit bedroom … unless you are going for a cave-like look. 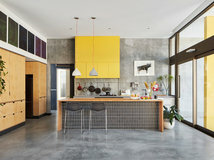 Dark grey actually requires lots of natural light to make the statement it is supposed to make without feeling oppressive. 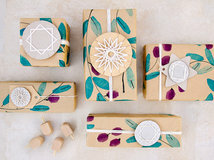 It is also at its best when balanced out with some other lighter elements and by some texture, too – think driftwood, a wicker basket, knitted throw, linen curtains, kantha quilt, etc. 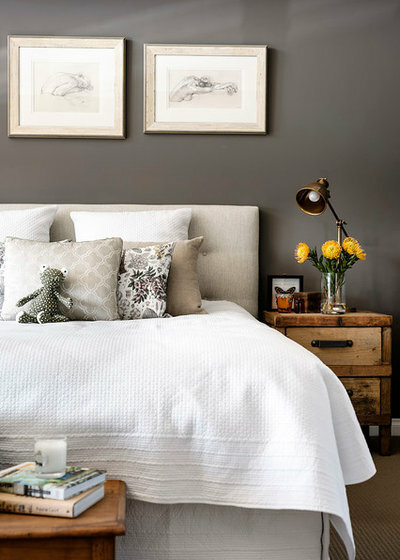 “Generally speaking, I do enjoy using grey in a bedroom because it immediately brings a kind of ‘cosiness’ to the room, while staying gender neutral. 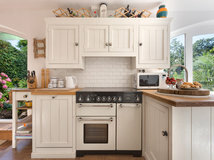 It is also a very versatile colour, which works with many other colours and materials. 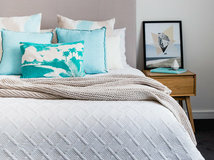 This means you can have a bit of fun with creating different styles and atmospheres, just by changing bedlinen and small accessories in the bedroom,” says Reffet. 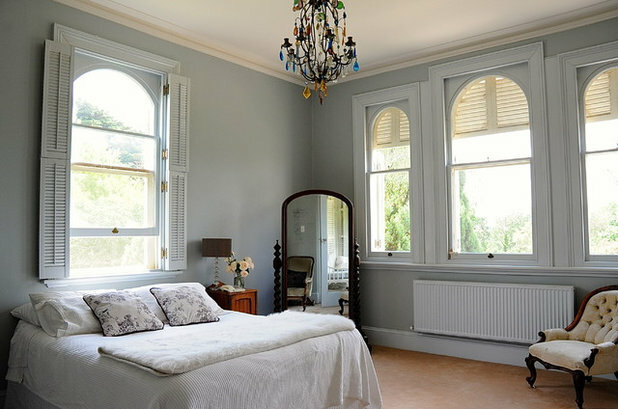 The colour for this master bedroom was matched to the room’s original duck-egg blue wallpaper. The owner took a chip of the wallpaper to her local Dulux store and had them come up with a custom colour to match. 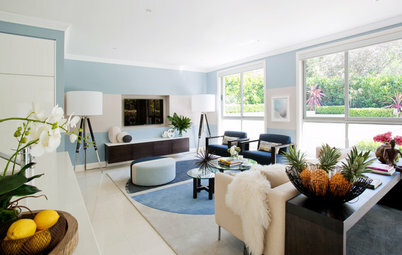 Get the look: Midnight and navy shades of blue can be really effective and, while dramatic, still offer a restful feel. Pair navy shades with white for a contemporary, nautical feel, or add similar jewel-toned decor for a rich, opulent effect. 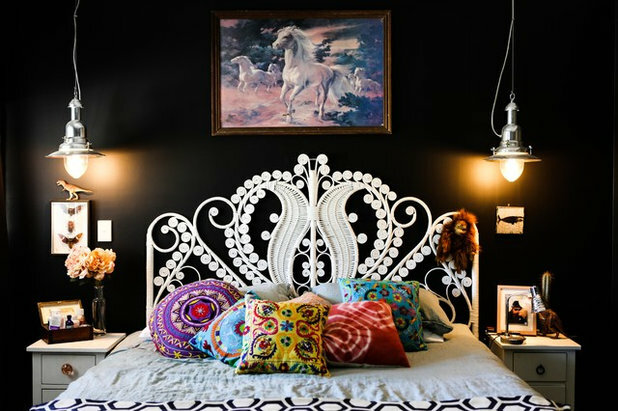 Here, by adding bright accents and quirky touches, it lends a wonderfully eclectic look to the room. 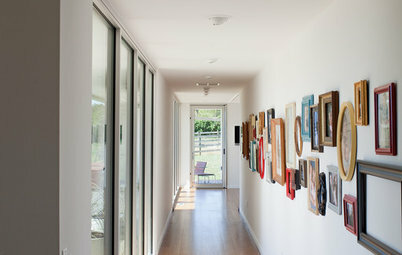 For best (less cave-like) results, ensure the room receives lots of light and is on the bigger side, with high ceilings. 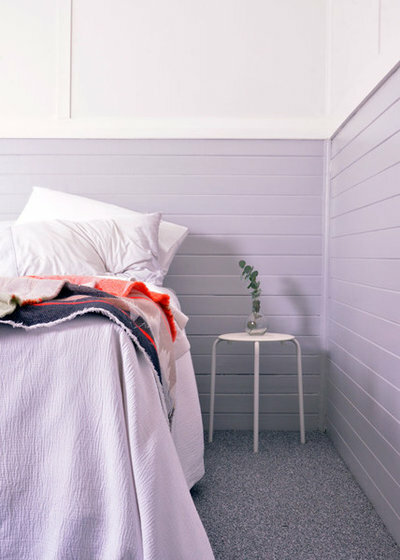 “Soft shades of grey-based lilacs and deep, rich aubergines are some of my favourite colours when I’m looking to introduce colour into the bedroom, as they both provide for a relaxing environment,” says Hooper, who worked on this bedroom renovation. 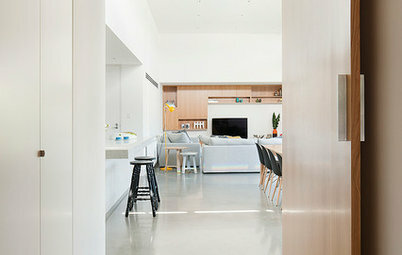 She adds that the colour works particularly well in this room because of vast amounts of natural light, as well as the Dulux ‘Whisper White’ used on the top half of the wall, which brings a lightness to the room without being cold. 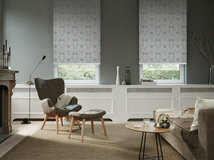 “Softer shades of purple present a light and airy feeling, while darker aubergines are perfect for that masculine edge. 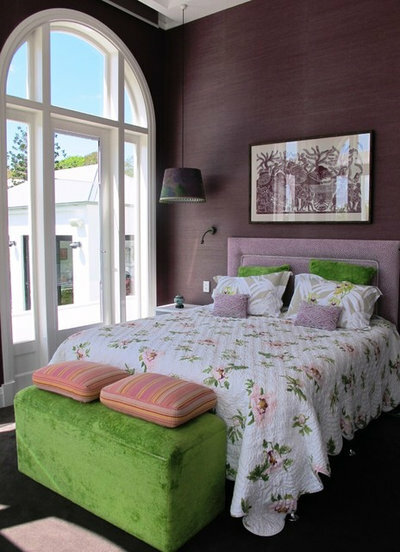 I tend to steer clear of bright purples as I find they don’t provide that relaxing environment which is essential in a bedroom,” says Hooper. 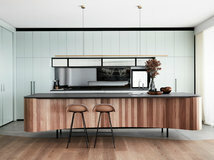 Get the look: If you opt for a darker aubergine, make sure the room receives plenty of natural light – oversize floor-to-ceiling windows and a high ceiling would be ideal. 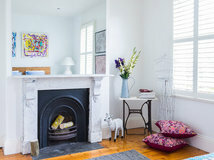 Light, bright and feminine accents and soft furnishings will also help to lift the colour rather than create a sombre feel. Green is one of those colours that can be tricky to work with. Get it right and you’ll love it for life. Get it wrong and you could regret it in two weeks. Get the look: Soft mossy tones can also look beautiful and wonderfully serene, especially when paired with light timber details and accents as in this room. This paint is actually a very, very dark shade of grey, but it’s so close to black we’ve decided to include it in this category. “My partner was shocked when I told him I was going to paint the bedroom almost black,” says Scholley. “He was worried that the room would feel too dark and heavy. He was happily surprised with the end result, and couldn’t quite believe how light and airy the room felt. 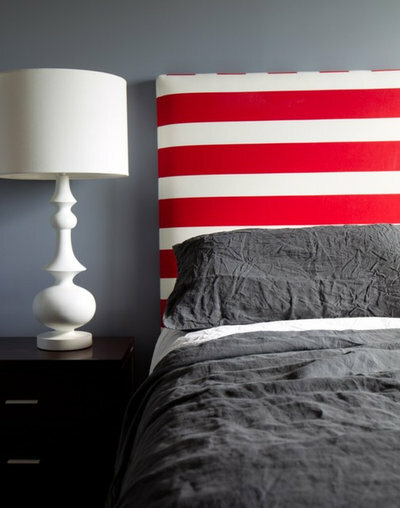 “I chose such a dark colour for our bedroom because I had purchased a fresh white ’70s-style ornate cane bedhead, and I felt this piece of furniture was quite feminine, so I wanted the wall colour to have a masculine feel to create a perfect balance for myself and my partner. Get the look: When a room is filled with as much light as this one, you almost need a black wall to add enough depth to the space. 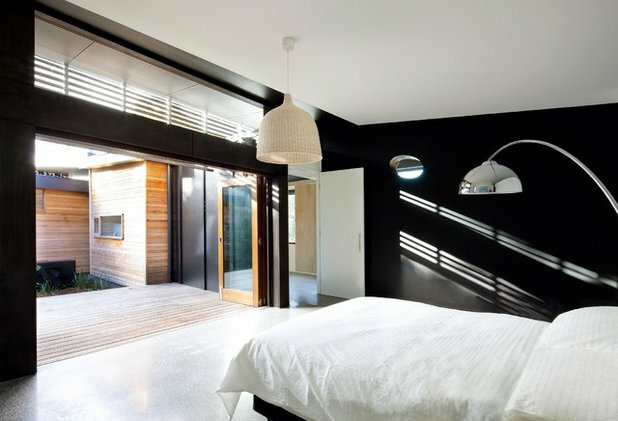 The black here looks anything but oppressive and cave-like, thanks to the huge doorway and white furnishings. Black also looks great in industrial-style spaces, with high ceilings and a range of contrasting materials around the wall to balance its strength – such as the timber ceiling and exposed brick walls in this room. 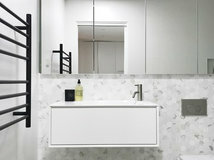 Even limiting black to a feature wall still makes an impact. The overall look of this bedroom is warm and cosy, especially when paired with deep beige on the remaining walls. 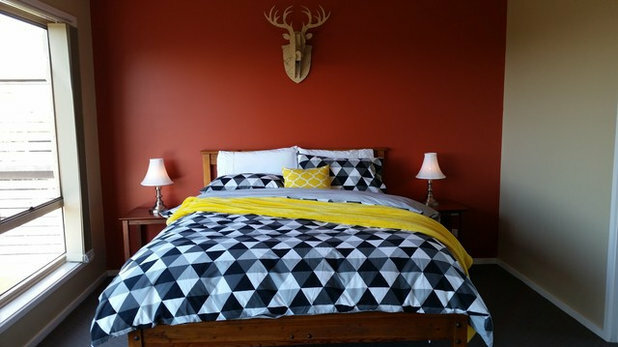 It could be easy to shy away from such a bold colour in the bedroom, but when used in the right way, as in this bedroom in coastal Victoria, red can be wonderfully warm and cosy, rather than garish and overpowering. In this home, Poole painted the entire home in Porter’s Paints Milk Paint and wanted to continue it into the bedrooms on the upper floor of the home. 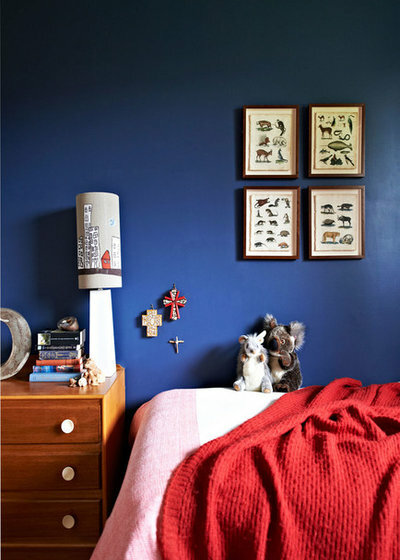 “But I wanted the wall colour in the bedrooms to be more pure, I hence mixed it half strength,” she says. 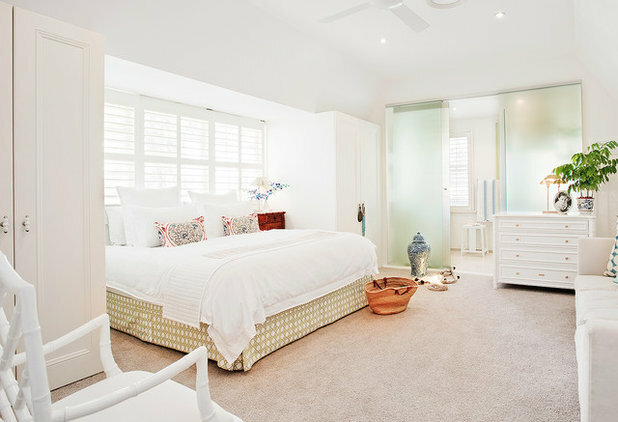 “I do adore white in bedrooms for many reasons; it provides the perfect canvas to layer any colour you desire and I am a big believer that our spaces need to evolve as we do. 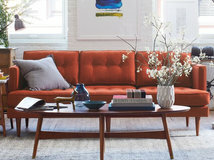 Having the flexibility to swap out cushions or linen is a powerful thing. 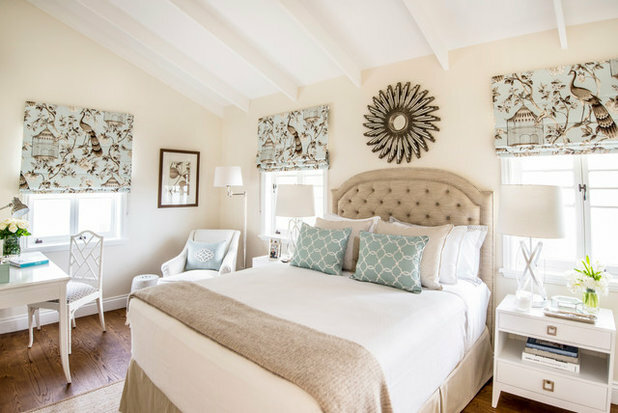 If, however, you still prefer the look of soothing neutrals in your sleep space, there’s no need for them to be bland and uninteresting. 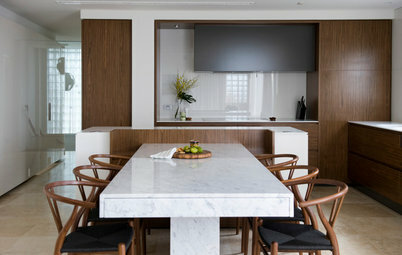 There are a number of warm, comforting shades of beige, cream, off-white and other neutrals that work well to create a light-filled yet serene space to retreat to. 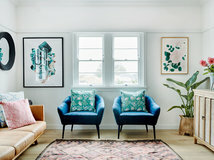 As seen here, they can easily be lifted by fun soft-furnishings such as the soft blue cushions, lively patterned blinds and other small details such as mirrors and furniture upholstery. Which of the colours above do you like best for a bedroom? Let us know in the Comments section. And if you found this story helpful, like it, bookmark it, save the photos and share your thoughts below. Join the conversation. Panelling and wallpaper looks great in our moody bedroom in the forest.